These Cinnamon Eggnog & Bourbon Cupcakes are one of a kind! Cinnamon, eggnog and bourbon cake topped with a spice bourbon frosting… WOWEEE! Our military commissary has stocked three flavors of eggnog right now. Pumpkin, Cinnamon and Gingerbread. The pumpkin tasted just like pumpkin pie, but I knew I didn’t want to bake with it. I’m kinda over pumpkin, ya know? And then I sipped on the cinnamon nog…. and HOLY COW! I’m not gonna lie. I’m not a fan of the eggnog. But the cinnamon eggnog was SO GOOD! I might even drink an entire quart of it! YUM! So, then my brain got to churnin… eggnog cupcakes. Yah, that’s typical. 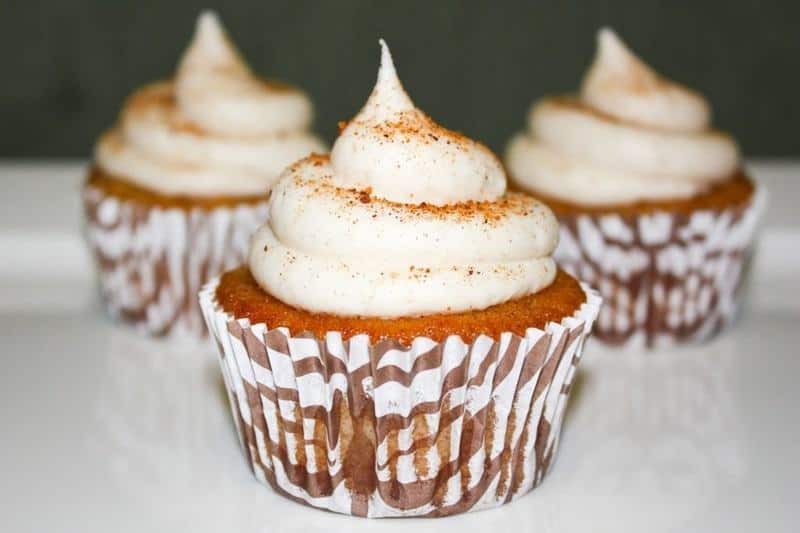 But Cinnamon Eggnog cupcakes? And what goes better with eggnog than a little bourbon? So uhm, yeah. 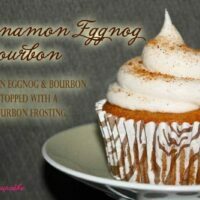 Cinnamon Eggnog & Bourbon cupcakes were born! Don’t worry, these won’t get you drunk… just make you happy! PS… the liners I used for these cupcakes are probably one of my most favorite liners EVER! They come from my friend, Kellie Sutton of Sutton Gourmet Paper. The thing that makes these liners so amazing is that they keep their color, texture and shape when baking. They DO NOT soak the batter or oils into the liners like others do. So every time you bake with Kellie’s liners, you get a perfectly beautifully wrapped cupcake! In a medium bowl, whisk together the flour, baking soda, baking powder, salt, nutmeg and cinnamon. Set aside. In the bowl of an electric mixer, combine the bourbon, eggnog, oil, vinegar, vanilla and sugar on medium speed until smooth (about 3-4 minutes). Add the flour and mix on low speed just until all the flour is wet. Stop the mixer, scrape the sides with a spatula and make sure all the flour is incorporated. Do not over mix. This step should only take 2-3 strokes. Bake for 18-20 minutes or until a toothpick comes out clean from the center of the cupcake. Allow to cool in the pan for 3-4 minutes until removing to a wire rack to cool completely. In the bowl of an electric mixer, cream together the cream cheese and butter until smooth. Scrape the sides of the bowl. One half cup at a time, add half the powdered sugar and beat until smooth between each addition. Scrape the sides of the bowl and add the whiskey, beat until combined. Sprinkle in the cinnamon and mix until incorporated. One half cup at a time, add the remaining powdered sugar and beat until smooth between each addition. Add the eggnog until you get the consistency you desire. You may want more or less of the eggnog. Mix in the salt and beat until smooth, about 30 seconds. Frost each cupcake and sprinkle with nutmeg to garnish. Wow! Sound good. Made your honey cornbread muffins for my dad’s birthday. Yum! You really got me into baking. I’m still ten, but I want to open a cupcake store one day!! These cupcakes have all the makings for one amazing treat! Right now I have a fridge full of regular egg nog. Would a substitution work with regular egg nog + cinnamon and if so how much cinnamon would you add?. Thank you for this fabulous recipe!!! Sorry for the inconvenience, but out of habit I put my full name. Could you please delete my last name? Thank you! Unfortunately, I don’t have the option to edit what you input into those fields. 🙁 You can delete your post and repost if you want! 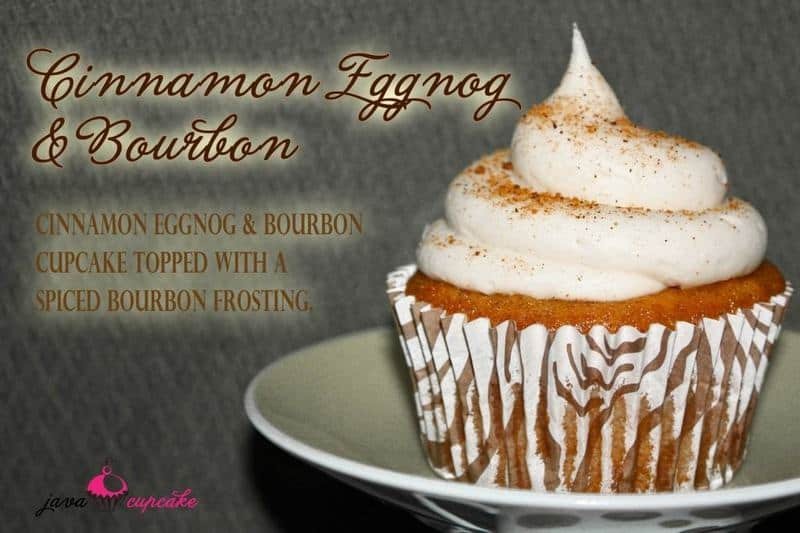 love love anything with eggnog these look amazing! what a great site you have, just signed up for emails!! Yay! 🙂 Welcome! Thanks for stopping by!! And ps…. these cupcakes were TO DIE FOR! These were a total flop. I think something is missing. The cupcakes fell apart. The frosting is good. The batter was really runny. Help. Oh no! I’m sorry to hear that! I made them again yesterday for a client and they turned out perfect. And you’re right… the batter is really thin. I hope you try them again! <3 GOOD LUCK! I love making cupcakes and love buying the pretty cupcake liners but after I bake the cupcakes they are dark and you cannot see the designs….what am I doing wrong? So…. with that said… check into Sutton Gourmet Paper and Bella Cupcake Couture to make your cupcakes gorgeous! Just made and they are really good. I LOVE the frosting with eggnog and bourbon!!! These cupcakes came out delish! The only issue I had with them was that I made a half batch because I didn’t have enough whisky, and it only made 6 cupcakes. The frosting didn’t come out like your pic, it was very runny. But like I always do, I whip up a cup of heavy whipping cream then fold it into the frosting to make it fluffy. Then it looks like yours 🙂 other than that I’m very pleased with this recipe! Great for the holidays. Awesome! Glad you enjoyed them! Betsy I truly enjoy using you cupcake recipes they’re great. Have had compliments on each one I have made. I do have a question on the above cupcake as did another person. I have looked every where for the Cinnamon Eggnog. So I can use the regular eggnog and add the 1/4 teaspoon cinnamon to the flour? What about the frosting just add some extra cinnamon and if so how much? Oh by the way the Maple Crown I used tasted in the Crown cupcakes tasted wonderful. Hi Debbie – Yes absolutely, just use regular eggnog and add cinnamon to the flour in the batter! 🙂 As for the frosting… just add cinnamon to taste! Happy Baking! Sorry but that was suppose to be your instead of you. Tasted after Maple Crown should have been left out. Sorry about that. Love your blog!! I was wondering, what would you suggest we substitute the whiskey for to get a non alcohol version? In the frosting, you could sub vanilla! There is no sub in the cake part… it’s what makes the cupcakes so amazing! The alcohol will cook off while baking. Happy Baking! I made these for Thanksgiving this year. My husband is a super picky eater and pretty much hates Thanksgiving because he doesn’t like pumpkin, pecan pie, or any of the typical Thanksgiving desserts my family prepares. I found this recipe and knew it would be a winner as we both love bourbon and eggnog. 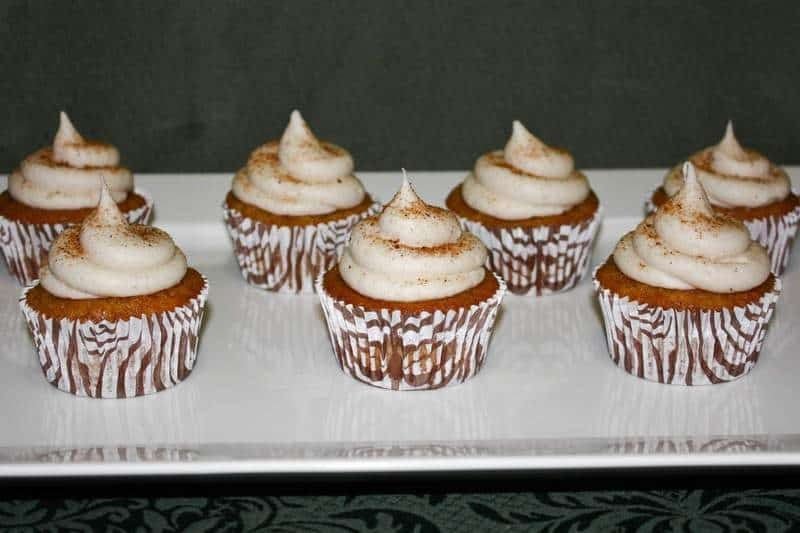 I used vanilla spice eggnog instead of cinnamon because my husband doesn’t care for cinnamon (seriously guys, he is really this picky) but kept everything else the same and the were a huge hit with my entire family! The only complaint I had was that the cupcakes REALLY stuck to the cupcake paper. You had to pry them out very very carefully. This could have been the paper I used, IDK, but the flavors were bangin’ and I will definitely make them again. Thanks for the recipe!! What kind of liners did you use, Logan? And yes… it may have been the liners causing them to stick because I didn’t have that problem when I made them. Next time, use a fork and scrape out all the goodness. hehe 🙂 Happy Baking! And I’m so super glad you liked this recipe!